The Watertown firm of Wheeler & Wilson Manufacturing produced one of the most successful products of the late 19th century. Thanks to inventor Allen Wilson and businessman Nathaniel Wheeler, the Wheeler & Wilson sewing machine competed right alongside those of such industry icons as Isaac Singer. 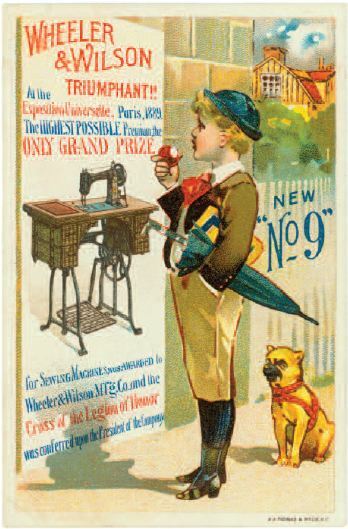 The popularity of the Wheeler & Wilson machine produced millions of dollars in revenue prior to the company’s sale in 1905. Nathaniel Wheeler was born in Watertown on September 7, 1820. The son of a carriage maker, Wheeler took up the trade as a young man before moving into the manufacture of metal objects, such as buckles, and then indulging his fascination for machinery. In 1848, Wheeler became one-third of the industrial firm of Warren, Wheeler & Woodruff. While on a business trip for his new company to New York City, he met sewing-machine manufacturer Allen Wilson and immediately recognized the potential of Wilson’s design. Allen Wilson was an inventor who spent his youth as a farmer, blacksmith, and cabinet maker, travelling from New York to Michigan, and eventually to Pittsfield, Massachusetts. Shortly after arriving in Massachusetts, Wilson went to work on a new sewing machine design and received a patent on it in 1850. After meeting Nathaniel Wheeler in August of 1851, Wilson agreed to oversee the production of 500 sewing machines for Wheeler’s business. Wilson continued to make improvements to his machine, eventually replacing his double-pointed shuttle with a rotary hook and bobbin design he patented on August 12, 1851—coincidentally the same day that Isaac Singer patented his latest model. In October of 1853, Wheeler and Wilson officially relaunched their enterprise as the Wheeler & Wilson Manufacturing Co. With an initial capital of $160,000, the company proved capable of competing with some of the top sewing machine producers in the country. By 1856, the company proved so successful that it outgrew its Watertown facilities and relocated to Bridgeport. There it took advantage of improvements in transatlantic communication and transportation to open an office and showrooms in London and ship its products around the world. The company won numerous awards for its design, including medals at the 1861 Industrial Exposition in Paris and the 1862 International Exhibition in London. The Wilson & Wheeler brand would not last long past the 19th century, however. In 1893, five years after Allen Wilson passed away in Woodmont, Connecticut, Nathaniel Wheeler died in Bridgeport. As an industry leader in sewing machine sales—having produced nearly 2 million units in the latter half of the 19th century—the company caught the eye of the Singer Corporation, which purchased it in 1905. Singer continued to promote the Wheeler & Wilson machines for only another decade before phasing them out for newer, more innovative designs. Porter, Wils. “Bridgeport, Conn., 1882.” Bird’s-eye Map. New York: W.O. Laughna, 1882. Connecticut History Online, Connecticut Historical Society. Link. 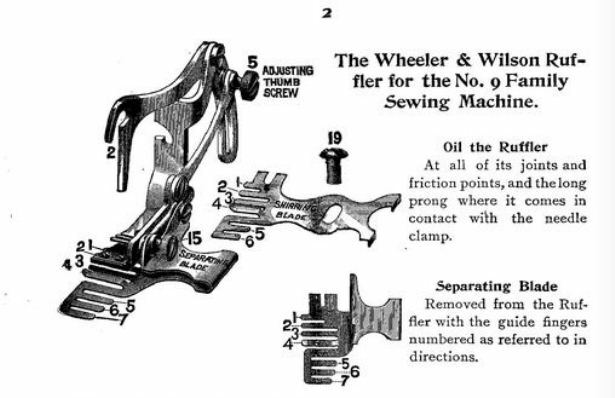 “Directions for Using the Attachments for the Wheeler & Wilson No. 9 Family Sewing Machine. Binder, Ruffler, Tuck Marker and Adjustable Hemmer and Feller, Which Is Adjustable for Different Widths of Hem or Fell.” Wheeler & Wilson Manufacturing Company, 1905. Link. Wilson, Allen B. Patent Number 8,296 - Improvement in Sewing-Machines. US8296 A. Watertown, CT, issued August 12, 1851. Link. “The Great European Triumph of Wheeler & Wilson.” Frank Leslie’s Weekly XXV, no. 628 (October 12, 1867). Link. Wheeler & Wilson Manufacturing Company. Operator’s Manual for Wheeler & Wilson No. 9 Family Sewing Machine - Form 21. Size of Needles and Thread to Be Used on Different Materials, 1905. Link.